Blenheim IV T1829 crashed in the North Sea off Westerland, Sylt on 11/4-1941. The aircraft belonged to RAF 18 Sqn. Bomber Command and was coded WV-P.
T/O 10:50 Oulton. OP: Anti shipping. Last seen flying towards Sylt from Amrum. It crashed into the sea at approx. 14:20 off Westerland after having been hit by flak from 3./lei. Flakabt.871 (fr.38/XI) and Marine flak and having been attacked by a Bf 109 fighter piloted by Fw Konrad Schönweiss of 1/JG 54. The crew of three perished. 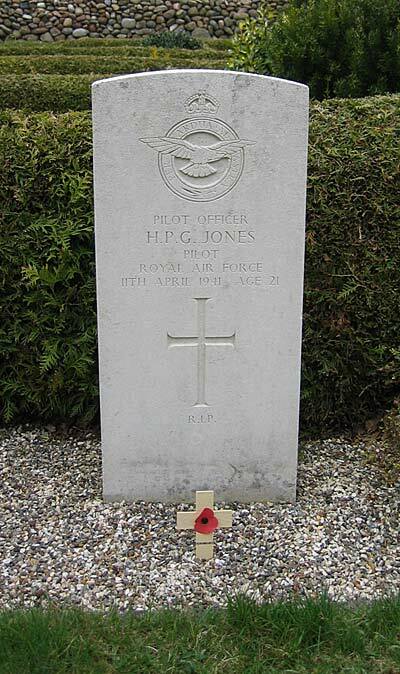 The body of Pilot P/O Harold P.G. Jones was found drifted ashore in Beach area no. 37, Aaberg Forstrand in Sdr. Nissum parish on 8/8-41 by Receiver of wrecks Jens Jensen. Jones was laid to rest in Sønder Nissum cemetery on 12/8 1941. The parish minister K. L. Aastrup officiated at the graveside ceremony. Observer Sgt John F. Horsham and W/Op-Air Gnr. Sgt Kennedy C. Walton have no known graves and are commemorated on the Runnymede Memorial. Sources : Police report, BCL, WD, CWGC, RL, TW, FAF.